Although Chicago comes in #10 on the list of Top 50 Most Bike-Friendly Cities, accidents still happen. If you were injured in a bicycle accident, you may be wondering if you have any legal recourse to cover medical expenses, property damage to your bike, and more. At Power, Rogers & Smith, L.L.P., our Chicago bicycle accident attorneys have the skill, experience, and knowledge to help you pursue a claim against the negligent party. Our team has helped countless clients on our way to recovering more than $4 billion for injury victims in our care. We know how to build a strong case focused on our clients’ best interests and individual goals. For your free consultation, call us at (312) 313-0202. According to Green Lane Project, Chicago is one of the top 7 cities with the most miles of protected bicycle lanes. Currently, Chicago has about 200 miles of bike lanes. By 2020, if all goes to plan, Chi-Town is expected to have about 645 miles of bike lanes. For one reason or another, many people have opted out of cars and into bicycles for their daily commute. The highest concentration of these bicycle commuters live in areas like Logan Square, West Town, Ukrainian Village, and around UIC. Google maps now has bicycling directions, so one way bicycle commuters can stay safe is by choosing the best route. Another way to stay safe is to limit what you carry, beware of cycling past car doors (one of the most frequent accidents for urban bicyclers is “dooring”), and be assertive. Nearly half of all crashes in Illinois occur in Cook County. According to the Illinois Department of Transportation, three bicyclists died in traffic accidents in 2013. At the state level, car-on-bicyclist accidents accounted for about one percent of all crashes - 3,586 incidents, 30 bicyclist fatalities, and 3,323 bicyclist injuries. Bicyclists are exposed to all of the elements surrounding them, including vehicles on the road. This is a dangerous situation when there are negligent drivers are on the road. Any time an accident occurs, the bicyclist can sustain serious injuries because he or she doesn’t have the same protection as a motor vehicle. These injuries can change someone’s life forever. Choosing a law firm to represent you can be difficult, but at the end of the day, experience and a track record of success matter. Our team at Power, Rogers & Smith, L.L.P. has helped countless injury victims seek the compensation they need after an accident. 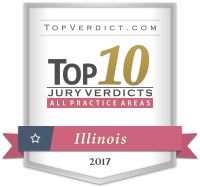 For our tenacity and legal ability, we have been named as Chicago Lawyer magazine’s No. 1 Plaintiff’s Law Firm in Chicago. We have also been recognized for our skill as we were listed as part of the Best Lawyers in America® 2019. We represent clients on a contingency fee basis. We don’t charge you unless we are able to successfully secure compensation on your behalf. We front all of the costs and are only paid based on a percentage of the compensation we recover. You can trust that our firm has your best interests in mind and we work diligently to hold the negligent party accountable for their actions. Call us today at (312) 313-0202 or contact us online to arrange a free initial consultation. When Should I Meet With a Lawyer? A: Yes. You should meet with an attorney as soon as possible after your accident. A: Potentially, yes. In many bicycle accidents, the injured party may still be entitled to insurance coverage or personal injury compensation – even if he or she was partially at fault for the incident. Every case is different, though, so speak with a lawyer as soon as possible to learn more about the legal options surrounding your specific case. What If it was a Hit and Run Accident? A: If you were injured in a hit and run accident, gather as much information as possible and share it with the police. This can increase the likelihood of law enforcement arresting the responsible driver. Additionally, it can make it easier for you and your attorney to seek financial compensation for your damages through your insurance provider. Important details of your accident to include, if possible, are: the make and model of the vehicle involved, the exact time of the accident, the location, and any other details that might be relevant to the case.